Please note that the content of this book primarily consists of articles available from Wikipedia or other free sources online. 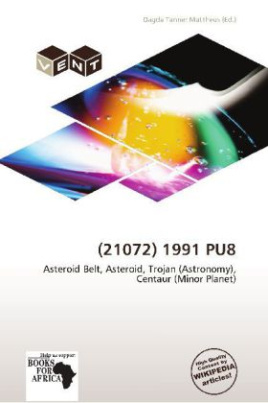 (21072) 1991 PU8 is a main-belt minor planet. A minor planet is an astronomical object in direct orbit around the Sun that is neither a dominant planet nor a comet, and thus includes the dwarf planets. The orbital categories of minor planets are the asteroids, trojans, centaurs, Kuiper belt objects, and other trans-Neptunian objects. The first minor planet discovered was Ceres in 1801. The orbits of more than 540,000 objects have been archived at the Minor Planet Center. The term "minor planet" has been used since the 19th century to describe these objects.